With regulations, such as MDSAP and ISO 13485 in place, supplier quality executives are tasked with maintaining compliance and ensuring supplier management programs follow standards with different demands on a global scale. To accurately assess suppliers, OEMs must communicate effectively in the early stages and qualify suppliers based on level of risk and supplier type, including traditional component suppliers, software suppliers, and chemical suppliers, all of which require unique and differentiated qualification standards. Through rigorous supplier management, OEMs must establish a line of communication to showcase manufacturer needs, such as the importance of process validation and performing audits, as well as understand the capabilities and needs of the supplier counterpart. 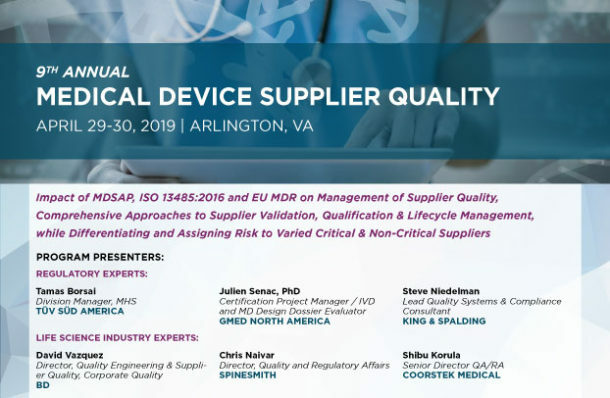 The 2019 edition of the highly anticipated Q1 Medical Device Supplier Quality Assurance Conference will continue to provide the highest level of educational engagement and networking collaboration for medical device executives, with an increased focus on specific implications of regulatory requirements and best practices to differentiate supplier management. Communicating risk between suppliers and OEMs, as well as, across the lifecycle will provide insight not only for supplier quality executives, but quality assurance teams responsible for the finished product quality. Via a mix of formats including panel discussions, exchange groups, and case studies, attendees have the opportunity to take away actionable content through engaging sessions and the sharing of best practices. The event will also offer a unique networking platform for delegates to connect with a multitude of key experts in the field.